We can safely say the launch of the new Zatchels brand – a range of contemporary and stylish satchels – has been a resounding success. A successful media campaign (albeit almost under the cover of darkness to keep the launch a secret!) 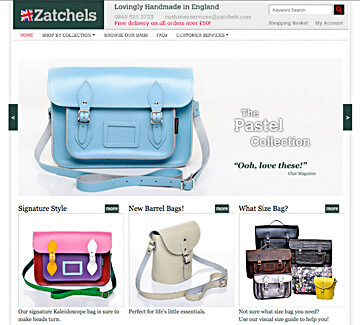 plus the launch of the Magento e-commerce website at www.zatchels.com means that the fashion world now has a new star. The reaction to the Zatchels range has been incredible; everyone who’s seen the products and viewed the website seems impressed. We’re pleased, our client is pleased, the journalists were warm in their praise of the products, and the consumers seem equally impressed. It would seem then that we’ve bucked the economic trend. With retail sales down, consumers struggling with bills, and the whole world seemingly on a bit of downer at the moment, we could have been forgiven for thinking the timing was all wrong. The fact is though that fashion does buck trends. In 2008 leading fashion pundits were forecasting that the recession, which had still to really bite deeply back then, would take its toll. By 2010, the retail sector was suffering but it didn’t collapse. Even if some brands did suffer it basically came down to a question of image. The fashion industry can sometimes be seen as decadent and self indulgent so what sets Zatchels apart from the crowd? Well, it seems everyone’s agreed that satchels are the ‘must have’ accessory of the year, which is all well and good so long as people can afford the ‘must have’. And fashion, accessories and cosmetics spend is also considered therapeutic; when all else fails buy yourself a new dress or a new lipstick. Where the Zatchels range really is a winner is in sensible pricing, affordable quality and the fine craftsmanship that lies behind this very British brand. And apparently being British – especially in the world of fashion accessories – can be cool. This locally based free to children magazine has undergone a big facelift with the help of our graphic designers. What Can We Do Today is a magazine aimed at families with primary school aged children who are looking for things to do in the holidays in Leicestershire, who like helpful, informative articles and of course who like a bargain! This, issue 12, of What Can We Do Today was designed, produced and print managed by the team at Mulberry Square; we even gave a helping hand to the copywriting! It was distributed at the beginning of this week to primary schools around Charnwood, including a few schools who haven’t received it before. It features various articles ranging from health to entertainment with a generous helping of discount vouchers and competitions thrown in too. On top of the work our marketing services team completed for the magazine, our web design lot were busy converting the old website over to a brand new WordPress based site. What Can We Do Today is now a great website for reading reviews of places to visit in the area, for entering competitions to win tickets to local attractions, or just for finding cheaper deals at local businesses and places to go! Why not try it now for some ideas about what you can do today…. We were approached by Custom Lynx to design and build a new magento e-commerce website to showcase their extensive product range and provide them with an online store. 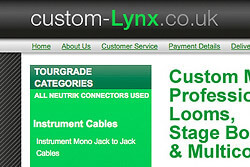 Custom Lynx are a trade company specialising in providing a wide variety of custom length cables for their customers. For those systems needing a lot of cables, they also offer the useful option of customising the colour of both the cables and Neutrik connectors so you always know which cable is which! Our graphic design team designed the look of the magento e-commerce site and its layout, whilst the products were catalogued and professionally photographed by our award winning in-house photographers. The result is a very good looking site with a clear layout and excellent product images, all of which are held on the large database contained within the website design. The new Custom Lynx website is now up and running and ready to take orders! We were recently approached by a new company called Bizzing to provide graphic design services to design and develop its branding, in addition to offering marketing services to support the company in its promotion. As well as the branding development, we were asked to design and develop a website for them to include many different levels of functionality, including password protected user accounts for customers and forum capability. We have designed a temporary static website to showcase Bizzing whilst we are busy with further web design and web development behind the scenes. In designing this website, we have been involved in creative copywriting, including SEO enhancement, as part of our marketing services and have sourced a range of images to support the website design. We have also employed our creative copywriting services to provide captions to these images to further enhance their message. There is clearly nothing like an overdose of spam to hurry things through the system. No not quite another award winning ditty from the Mulberry Square copywriters – just a situation that has come to a head in fact. A few weeks ago we held meetings with a potential new client and what with the pressures of this company fulfilling its daily duties, winning business and attending an exhibition in far flung lands, communication has been limited to say the least… until today that is. This client had an exchange server installed by Mr IT guy some time ago to work his email through the system and at the same time Mr IT guy organised his email hosting too. To cut what is a short story to the chase, our new client has been overwhelmed ever since by unsolicited approaches by random emails offering to boost his prowess amongst many other things – I think you all get the gist of it! 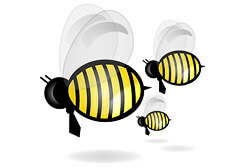 Anyway what we at Mulberry Square have been able to do is recommend our IT guy, Lorne Smith of Unecom, to provide our client with a server solution to suit the size and type of business that it is and switch his email to pop3 or imap email accounts hosted on our reliable UK carbon neutral web hosting servers which feature industry leading spam filtering software which, once installed, will provide our client with virtually spam free email and a much happier demeanour I’m sure!